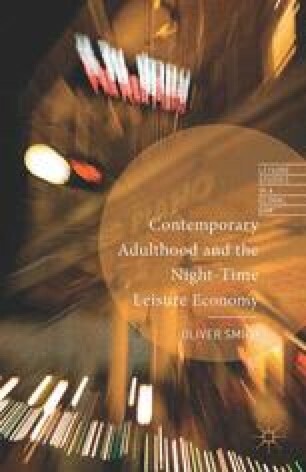 This chapter explores the practical realities and lived experiences of two individuals whose continued involvement in commodified nighttime leisure has had a profound impact upon their sense of self. These individuals were of particular importance to this study, as without their role as ‘gatekeepers’ to the continued pursuit of hedonism, much of the research and insight contained within these pages would simply not have been achievable. They fulfilled the role of gatekeeper not only in the methodological sense (see Whyte, 1959), but also in a more direct, straightforward sense in that they act as cultural gatekeepers within their own extended friendship networks, sending out texts, getting people motivated and ready to go out, determining which bars to go to, whose round it is and so on.